the transfer switch is disabled. Russelectric® is an international company that custom designs and builds power control systems and equipment to meet the stringent performance and reliability requirements of healthcare, data center, communications and other critical facilities. Russelectric - a Siemen's business is one of the world's most respected manufacturer of automatic transfer switches, power control systems and related equipment. Russelectric is proudly manufactured in the USA. The Arthur N. Ulrich Company has been a Russelectric manufacturer's representative since 1968 and over the years has been instrumental in developing and servicing the following states of Ohio, Kentucky, Indiana, Western Pennsylvania, Tennessee, West Virginia and Michigan. We have the knowledge and expertise to assist you with any project, large or small. Contact us today to get started! 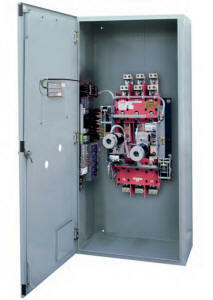 Russelectric® automatic transfer switches are industry leading, modern, high-speed switching devices designed to transfer electrical loads from a preferred power source to an alternate power source when voltage and/or frequency varies from preset limits, and to retransfer loads when preferred source is restored. Russelectric® RTS-30 Series automatic transfer switches are the most complete line of 480 VAC 30-cycle-rated UL tested switches available today. Russelectric RTS-30 / 30 Cycle-Rated Automatic Transfer Switches are available in the following versions: open transition and closed transition. 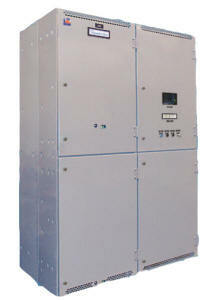 The Russelectric RPTCS microprocessor automatic transfer control system controls all operational functions of the ATS. Russelectric® RTS-30 (30 cycle rated) Series nonautomatic transfer switches are ideal for applications in which immediate restoration of service is not critical, and local maintenance personnel are available to initiate transfer. The nonautomatic transfer switch is a UL-listed double-throw device with identical withstand ratings and design characteristics to RTS Series (low voltage) automatic transfer switches. Russelectric® RTS Series Russelectric Medium-Voltage Circuit Breaker type Automatic Transfer Switches are designed to transfer electrical loads from a normal power source to an emergency power source upon reduction or loss of voltage and to retransfer loads when normal power is restored. All Russelectric RTS Series circuit breaker automatic transfer switches have been fully UL tested, listed, and labeled under UL 1008A. 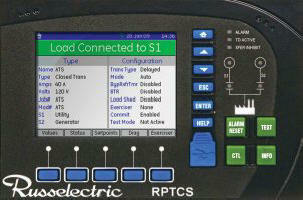 The Russelectric® RPTCS microprocessor automatic transfer control system controls all operational functions of the ATS. Each RPTCS is programmed at the factory to control customer-specified options as well as standard features. 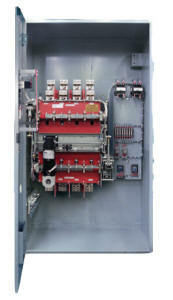 The RPTCS control system can also be retrofitted to replace legacy control systems in the field. Russelectric® RTS-03 Series automatic transfer switches are the most complete line of 480 VAC 3-cycle-rated UL tested switches available today. Russelectric RTS-03 / 3 Cycle-Rated Automatic Transfer Switches are available in the following versions: open transition and closed transition. 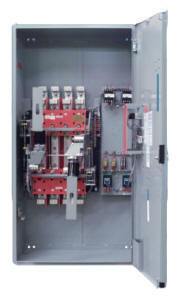 The Russelectric RPTCS microprocessor automatic transfer control system controls all operational functions of the ATS. Russelectric® RTS-03 (3 cycle rated) Series nonautomatic transfer switches are ideal for applications in which immediate restoration of service is not critical, and local maintenance personnel are available to initiate transfer. The nonautomatic transfer switch is a UL-listed double-throw device with identical withstand ratings and design characteristics to RTS Series (low voltage) automatic transfer switches. Russelectric® also manufactures the following specialized transfer switches: service entrance, fire pump and multiple source systems. Available for use with the Russelectric® RPTCS transfer control system, the DTWG provides access to real-time and historical status and performance data — ATS and source status, ATS configuration, trends, and event logs — from a PC, smartphone, tablet, or any web-enabled device running Java. Russelectric® bypass/isolation switches provide all the functions of a Russelectric automatic transfer switch plus the ability to bypass power from a live source to load in the event the transfer switch is disabled. 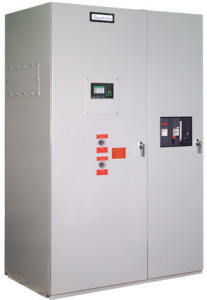 It also allows the transfer switch to be isolated and de-energized for maintenance, testing, or repair. The True drawout construction allows safe, easy removal of the transfer switch and eliminates the need to make any electrical or mechanical disconnections. 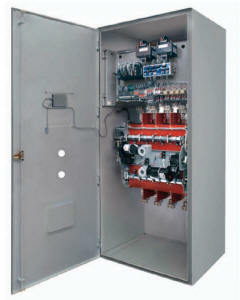 *Russelectric is the only manufacturer that offers both load-break and no-load-break bypass switch designs. Russelectric® RTS-30 Series Bypass/Isolation Switches are the industry's most comprehensive line of 480VAC 30-cycle UL tested switches available today. Russelectric 30-cycle bypass/isolation switches are designed with 3 distinct compartments, separated by barriers, to simplify switch installation and protect personnel. Russelectric® RTS-03 Series Bypass/Isolation Switches are the industry's most comprehensive line of 480VAC 3-cycle UL tested switches available today. Russelectric 3-cycle bypass/isolation switches feature rugged bypass switching contacts that are identical in design and carry the same ratings as the ATS switching contacts. Russelectric® custom designs and builds low- and medium-voltage power control systems to meet the stringent performance and reliability requirements of data centers, airports, hospitals, communications, energy, defense, and other mission critical facilities. 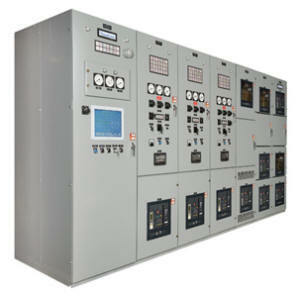 Russelectric systems can control on-site emergency generator operation, synchronizing, and distribution. 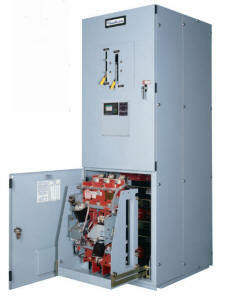 Switchgear can provide open-transition transfer or utility/generator paralleling for closed-transition transfer. Every Russelectric® power control system is custom-designed and manufactured to specific customer requirements and stringent performance, safety and quality standards. All components are of the absolute highest quality. 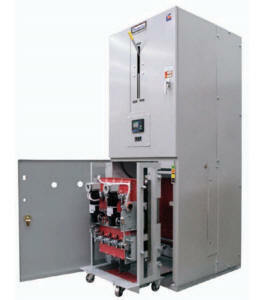 Redundant industrial-quality PLC controls ensure flawless system operation - even in the event of a control failure. 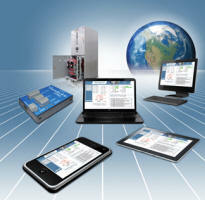 Optional Custom SCADA provides supervisory control. Emergency power control systems are complicated. So, in an actual emergency, knowing how they work and how to best react can often mean the difference between experiencing a minor inconvenience or a major problem. 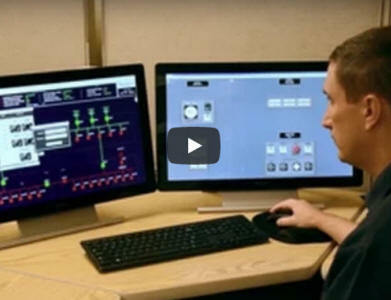 Designed to mimic the operation of the customer's Russelectric switchgear/system, Russelectric® Simulators allow personnel to train on the automatic (and manual) operation of Russelectric® Power Control Systems. A Russelectric® SCADA system allows the user to monitor system operation, acknowledge alarms, and review PLC setpoints and alarm history. All screens are custom designed for each power control system, providing the most realistic, accurate display possible. The basic SCADA system includes a dynamic one-line display with changing color codes to indicate real-time power switching device status and power source connection to the loads. Event logging, alarm logging and help screens are also included. Optional enhancements include highly detailed graphic displays of the physical arrangement of equipment, control panel close-ups, instrument displays indicating actual values, and the ability to initiate control functions. An optional simulation system, based on SCADA graphics, allows operator training off-line without affecting any operating system parameters. We recognize that when a power control system is off-line, you're exposed to the very risks that the system was supposed to protect you from. Russelectric® is committed to keeping its customers up and running with dependable, clean power. Russelectric's organization of highly trained factory field service engineers are located strategically throughout the country. Russelectric can respond quickly and professionally to any customer problem or need - 24 hours a day, 365 days a year. Russelectric's field service organization oversees system commissioning and start-up, factory service coordination, aftermarket part sales, preventive maintenance plans and training with every system.